Next-generation wireless technology gives students the ability to work anywhere on campus. 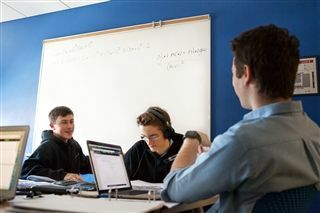 Greenwood is designed for the digital native, with technology and collaboration tools fully integrated into our program. Technology at Greenwood focuses on how teachers and students can explore new ideas, be creative and promote positive connections to their peers and their community. We continuously assess new developments in hardware and software to ensure that our teachers have the best tools to personalize students’ learning experience. Digital literacy is a major focus of our program. Students learn not only to use a wide array of hardware and software tools to support their learning, but to be mindful of their digital footprint. In addition to wireless Internet, digital projectors and Smart Boards, every classroom offers wireless A/V connections to give students and teachers the freedom to move around the space as needed. Inside and outside of the classroom, student learning is visible to the teacher using cloud technology that shares student work to a teacher dashboard in real time. This virtual teacher dashboard allows our teachers to get an overall snapshot of individual student learning and to easily give constructive, immediate feedback.